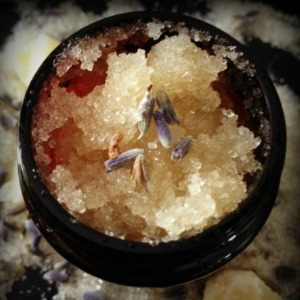 Here is a simple, 4-ingredient lip scrub that you can whip up in seconds to exfoliate, smooth and soften your lips. Mix all ingredients in a small bowl, allow to cool to room temperature and transfer to an airtight jar. Apply to dry lips in a gentle circular motion for about 15 seconds. Wipe scrub off with a warm, damp cloth and immediately massage a bit of cocoa butter or your favorite lip balm into your lips. Treat yourself to this lip scrub weekly and use within one month. Apply lip balm prior to going outside into the elements - every single time. Look for lip balms that are rich in natural moisturizing oils and butters, as well as beeswax, which helps lips retain moisture. Avoid the urge to lick lips when they feel dry, as this will continue the cycle of dry lips. Apply lip balm instead. Apply a nourishing lip balm or lip oil, like Lip Serum No. 14, prior to bedtime to regenerate lip tissues while you sleep.